Glow in the dark dinosaurs will add an element of fun when adding these jurassic stickers to bedrooms or classrooms. Stick them on walls and ceilings, these glow shapes charge from natural or artificial light, and will glow brightly when the lights go out. They're ideal for making bedtime fun and making the bedroom feel prehistoric! 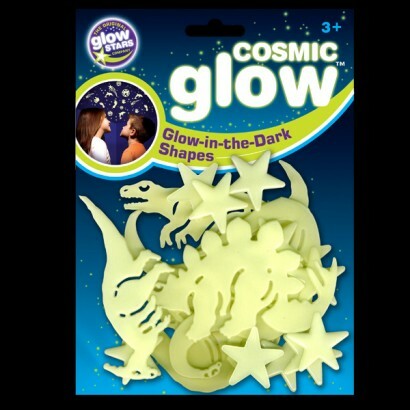 Find out more about how glow in the dark works to get the best from your glow dino's. The Glow Company Says: Sorry about that, Pauline, regrettably the sticky pads included with this product don't always work on every kind of surface and wall covering. You may find that good-old blue tack will do a better job for you. If you need any help with the product, just get in touch. The only downfall to these is that I don't think the sticky buds are strong enough for the larger Dinos as they keep falling off the ceiling...think larger stickies should be provided.Other than that I wouldn't hesitate from buying from the Glow Company again.